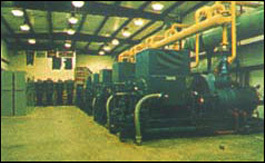 Hoffer Flow Controls supplied two flowmeters for use in the snowmaking process at Whitetail Ski Resort located in Mercersburg, Pennsylvania. One of the flowmeters is a 2″ gas turbine flow meter that will be used to monitor air during the snowmaking process. The other meter is a 1½” *STAR* flowmeter that will be used on water flows. Whitetail Ski Resort is located in southern Pennsylvania almost in the center of the state. Mike Collins, along with Brian Alex, are “Snow Technicians” responsible for managing the snowmaking process at Whitetail. Mike advises that the “window of weather opportunity” during which they can make snow is often very short due to their location. Therefore, when the temperature drops below freezing, they must move quickly and efficiently to make as much snow as possible. They have 280 snow guns that may be moved around the 17 ski trails. They draw from a 100,000,000 gallon water reservoir to make the snow. When the conditions are right for snowmaking, Mike reports they are drawing approximately 5400 gallons per minute. 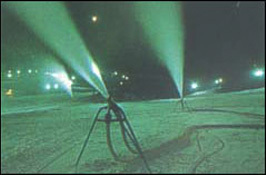 The Hoffer 1½” *STAR* flowmeter along with a Hoffer rate indicator/ totalizer is used to monitor the water from the impoundment to the various individual snow guns. The Hoffer 2″ gas flow- meter is used to monitor and control the air to the snowguns. The water to air ratio is critical to make “good” snow. If this ratio is off, the snow can be too heavy or wet. With the information obtained from the Hoffer meters, Brian and Mike can be sure that the snow guns are operating at peak efficiency and in the proper ratios. The rate indicator/totalizer units are battery powered by an internal lithium battery to provide approximately 3 to 5 years of field life. Power, therefore, is not required by the Hoffer Flow systems which makes installation easier and more cost effective. The rate indicator units are directly mounted to the flowmeters and located outdoors,therefore, a wide operating temperature range for both the electronics and the flowmeters was a must. The operating temperature range of the Hoffer flowmeters and the totalizer easily met this challenge. 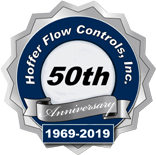 Hoffer is pleased to provide accurate flow measurement systems to help meet the criteria of another challenging application. If your winter recreation plans include a little snow skiing in central Pennsylvania, you may want to try White Tail. If the weather is right for snowmaking, you can be assured that the their snowmaking capabilities, along with accurate flow measurement provided by the Hoffer systems will provide you with some of the finest man made ski conditions along the East Coast. For all you ski buffs, Happy Skiing! For those of you with challenging flow applications, call us and let us help.